Chateau Milandes is on the banks of the river in the heart of the Dordogne department, a few kilometres south-west of Beynac - it is part of a cluster of medieval castles with Chateau Milandes and Castle Castelnaud to the south of the river and Chateau de Beynac to the north. The castle was built in 1489 by the Lord of Castelnaud, who previously lived in the medieval fortified Chateau de Castelnaud, because Lady Castelnaud wanted somewhere a bit more welcoming to live than the Castle at Castelnaud. The castle combines various architectural elements, with medieval towers and gargoyles reminiscent of a medieval fortress and more decorative renaissance features such as the large number of windows and ornate surrounds to allow light to flood into the building. By the 18th century the castle had become abandoned and was falling into disrepair, a situation made worse after the revolution and a subsequent fire caused important damage in the 19th century. 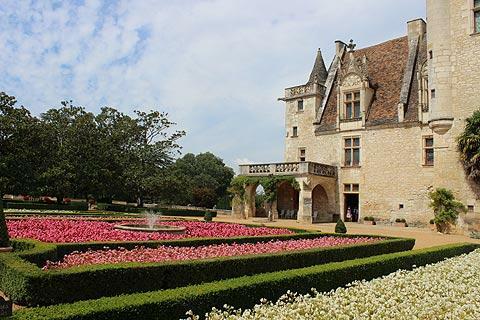 In the years after 1900 the Chateau was bought by a rich businessman who carried out very extensive renovations and modifications, including the addition of towers, arcades and turrets, and soon after the formal French style gardens that surround the Chateau des milandes were designed and planted. After the many changes and additions over the centuries it is quite extraordinary that the castle today presents such an attractive overall appearance. Most unusually for a medieval castle in the Dordogne, it is during the 20th century that Chateau des Milandes reached the height of its fame. This began in the 1930's when the castle was bought by the famous American cabaret singer/dancer called Josephine Baker. Josephine and her life now dominate the chateau - she had a very colourful life, from her early days as a cabaret performer with the Folies Bergeres (famously performing in a banana skirt and nothing else - the skirt is now on display at the castle). With her wartime work in helping the local French resistance fighters, and on to her subsequent adoption of numerous children from around the world - her so called 'rainbow tribe', Josephine Baker herself was 'adopted' and much loved by the French people. Sadly financial ruin meant Josephine had to leave the chateau in the 1960's, after which the castle changed owners several times. 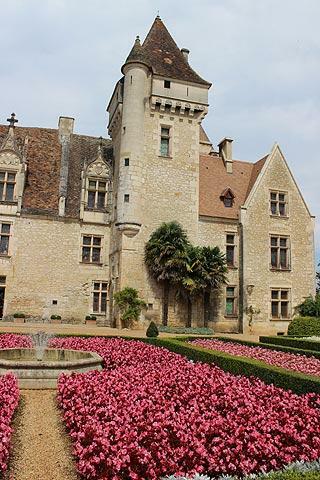 The current owners have dedicated the castle to the memorable life of Josephine Baker, which is commemorated both in the chateau museum dedicated to the artist, and in the castle rooms which are decorated in art-deco style (the bathrooms are among the highlights of a visit) and feature numerous exhibits relating to the life of Josephine Baker, such as the dresses she wore when performing. The extensive gardens around the castle are set over several terraces and mostly laid out in the formal French style of gardening, surrounded by a more informal park area with many interesting trees. The castle is open from the beginning of April to the end of October, entrance price around 9 euros when we visited. Chateau des Milandes also holds falconry displays. usually around 3pm and 4.30 pm, and lasting about 30 minutes (included in the entry price). 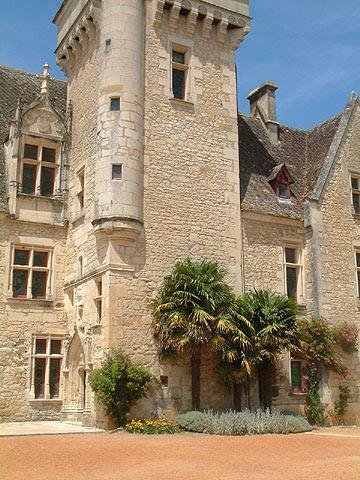 See a detailed article about Chateau Milandes in our French Castles section or see other Dordogne castles.